Poster is in NICE VERY GOOD condition (pinholes, small tearing, slight glue remains on top front, light stain marks), see picture. Approximate size is: 27" X 19" inches 69 X 48 cm. Standard size for exYugoslavian posters. Poster looks MUCH BETTER than on pic, if you have any questions or need scans in higher resolution please ask and I `ll be glad to send and answer you. All posters were used for theatres displays and they never were for public sale. IT WILL TAKE YEARS BEFORE MANY OF THEM EVER SURFACE AGAIN. Thank you for your interest and all the best. 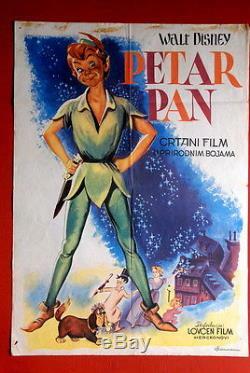 The item "PETER PAN WALT DISNEY 1955 MEGA RARE ORIGINAL VINTAGE EXYUGO MOVIE POSTER" is in sale since Tuesday, September 16, 2014. This item is in the category "Entertainment Memorabilia\Movie Memorabilia\Posters\Originals-International\1950-59". The seller is "hardmetal" and is located in 21000 Novi Sad. This item can be shipped worldwide.